This unique journal in psychology is devoted to publishing original research and theoretical studies and review papers that substantially contribute to the understanding of intelligence. It provides a new source of significant papers in psychometrics, tests and measurement, and all other empirical and theoretical studies in intelligence and mental retardation. 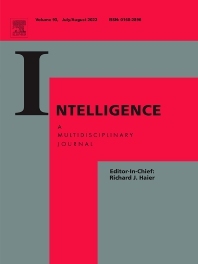 The journal Intelligence publishes papers reporting work which makes a substantial contribution to an understanding of the nature and function of intelligence. Varied approaches to the problem will be welcomed. Theoretical and review articles will be considered, if appropriate, but preference will be given to original research. In general, studies concerned with application will not be considered appropriate unless the work also makes a contribution to basic knowledge. Affiliated to the International Society for Intelligence Research.